Posted in: A Walking Tour of Old Ravenswood. Tagged: 1893 structures, 4332 N Paulina, Arthur Hussander, Bob Fosse', Chicago Board of Education, Conrad Sulzer, Hyde Park High School, John J. Flanders, Joseph Stockton Elementary School, Lake View High School, Louis Nettlehorst Elementary School, Mary Courtenay Elementary School, Ravenswood Elementary School, Ravenswood Land Company, schools, Senn High School, Sulzer Street, Sulzer Street School. Architect John J. Flanders designed the center section of the school in 1893. The north and south sections were added presumably in 1912, by the architect Arthur Hussander, who also build Senn High School in Edgewater Glen and the southern block of Lake View High School along Irving Park Road. Note tendril patterns of Flander’s cut stone, replicated in terra cotta on north and south sections. Abundance of stone detail and clean design lines. Also note damage done by modern window sashes, bricked in window openings, sandblasting of brick in center section. Flanders’ design anticipates some aspects of the Prairie School, with wide, overhanging cornices and horizontal elements incorporated as a visual stimulant to a sense of continuous flow. The cupola was not merely decorative. It served as a sanitary improvement, facilitating the exit of smells from the sometimes unwashed children. 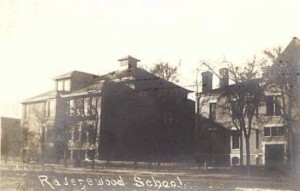 This school was built as a replacement for an earlier structure, built in 1872, which was itself the second Ravenswood School. The first was built by the Ravenswood Land Company as an inducement for families to move into this area. 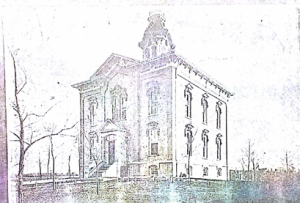 Built at a cost of $15,000 in 1893, the structure is the oldest elementary school building in the city. 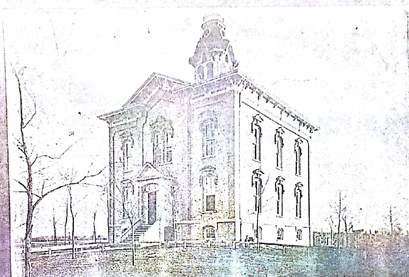 The 1872 building, a four room brick structure, was called the Sulzer Street School because of its proximity to Montrose Avenue, then called Sulzer Street or Sulzer Road in honor of the first European settler in the area, Conrad Sulzer. The school was enlarged during the summer vacation of 1888 to eight rooms to meet the ever-growing school age population of the area. The 1891 fire atlas noted kerosene lamps used for lighting the older school, chicken yards in the back, and said that the janitor lived in the school’s basement. Flanders’ design, incorporating steam heating and “sanitary improvements”, was a big improvement over the earlier building. The architect’s Compensation plan may have had something to do with the state–of–the-art design of this building. When Flanders designed this building, he was working on a percentage commission basis for the Chicago Board of Education. With the population of Chicago exploding, and therefore with a critical need for schools, the city spent more than $2 million between 1890 and 1893 on building new schools and making major repairs on existing schools. Flanders earned $43,000 for his work, and the ire of several unsalaried Board of Education members. One board member demanded to know why one building design could not be used for every school which the city would build. 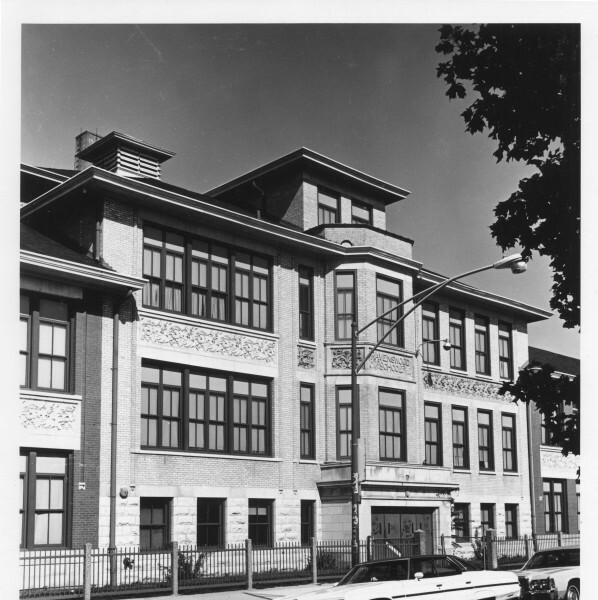 Among many other schools designed by Flanders is the Louis Nettelhorst Elementary School on Broadway in Lake View, which was also added to by Hussander. Between 1884 and 1893 Flanders designed more than 50 projects for the Chicago Board of Education. By virtue of the sheer number of his buildings, from his early Queen Anne designs, such as the Hyde Park High School, to his later projects, such as this one, Flanders had a significant impact on Chicago’s city-scape. Hussander’s wings added twelve rooms and many stairs. These stairs became a point of contention much later in the 1970’s when parents and the school council complained that they made much of the space unusable and turned down $500,000 in rehabilitation work, because they said the stairs would make the work impossible. In 1929, Ravenswood School’s junior high students were moved to Stockton School, currently called Mary Courtenay School, just a few blocks east on Montrose Avenue, which was then a junior high school. Because there was unused space at Ravenswood School, Lake View High School used the space for their freshman students. At some point later in the 1930’s, the junior high classes were brought back to Ravenswood School. Ravenswood has a very famous alumnus in Bob Fosse – Tony, Emmy and Oscar award-winning director (and choreographer), who graduated around 1941. CCL Survey; Permits #549 on 4/27/1894 and n 155? on 12/27/1895, as well as #a6942; n1; Page 362; File 20983 on 8/17/1912. See Ellen Wineberg’s “Field Survey of Chicago Public Schools,” Chicago, 1981. Historical records. 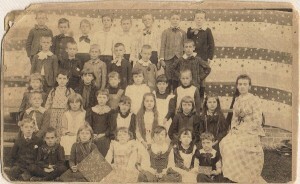 Ravenswood Elementary School History. Continue the tour to the corner of West Montrose Avenue & North Paulina Street. The next destination is the corner north of you, about 410′ from you.